Meeting began with some recap and context setting — maybe a 1/3 or more said this was their first meeting. 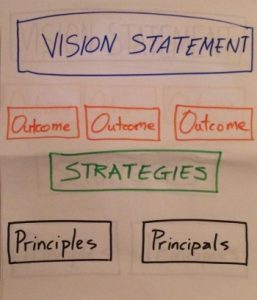 A vision statement is: a (desired end-state) a short (preferably one sentence statement) describing the clear and inspirational long term desired change, resulting from the work. 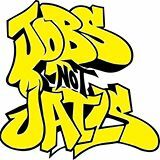 “The Jobs Not Jails movement advances economic and racial justice by ending mass incarceration and ensuring living wage jobs for all” or …ensuring living wage jobs for all in Massachusetts and beyond”. We then reviewed the following outcomes to determine if accomplishing these will progress the movement towards the vision. Generally everyone was receptive to these with some suggestions and wordsmithing. We spent some time discussing how we would measure or develop indicators for each. A noted comment was that 1-3 read like outcomes and 4-6 seemed more like strategies. There was some discussion about combining 4. and 6. or 5. and 6. Goal of next meeting is to spend a few minutes quickly reviewing and finalizing vision and outcomes, then spend bulk of time working through strategies (power shifts), and values/principles to complete the Common agenda framework. Individuals from We Are the Ones also joined us to talk about the recent decentralized Black Lives Matter movement. Their name refers to not being able to wait for “our Martin nor our Malcolm,” but recognizing that they are the ones they have been waiting for. We once again want to thank them for their time and continued energy. Legislative update: 57 co-sponsors signed onto our Justice Reinvestment bill. Senators can continue to sign on as co-sponsors until the bill reaches the Senate floor. Also Suffolk County Sheriff Tompkins signed on!